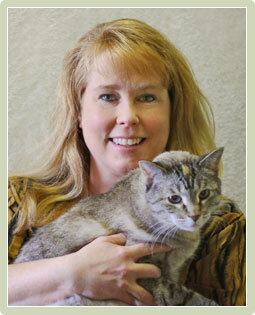 Lisa joined Stone Veterinary Hospital in 2007. As the practice manager, her responsibilities include client service, insurance processing, scheduling, inventory, and accounts receivable. "Stone Veterinary Hospital is truly the most compassionate place for both our clients and their pets," she said. She particularly loves working with clients and their pets and helping people find new pets through her involvement with local animal rescue groups. Lisa has over 25 years in the field and is a member of the Veterinary Hospital Manager Association. She also is actively involved with a number of animal rescue groups, including Flora's Pet Project, Poodle Rescue, Hope Spay Neuter Clinic, and Friends of Cheshire Ferals. Lisa's interests outside work include gardening, reading, animal rescue, and history. She has three Siamese mix cats, Eli, Esmirelda, and Peyton. As a surgical technician with Stone Veterinary Hospital since 1998, Jessica's responsibilities include surgical prep, anesthesia, and patient care. She especially appreciates "working with some of the best veterinarians in the area" and the new technologies that are available at the hospital. Jessica earned her bachelor's degree in animal science and her associate's degree in veterinary science from the SUNY Delhi and SUNY Cobleskill. She has a horse named Argento. With over 10 years of experience in the veterinary industry, Kate has shown to be a valuable Veterinary Technician here at Stone Veterinary Hospital. 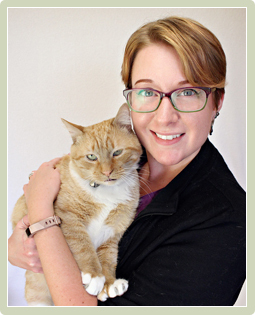 As a graduate of Penn Foster, Kate has a degree in Veterinary Technology and is laser therapy certified. 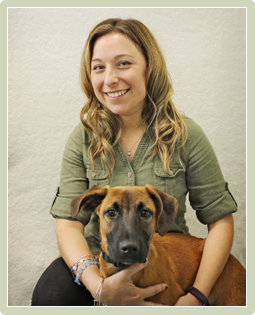 Kate helps to administer the highest standards of veterinary care imaginable and does so with a radiant smile. Kate is responsible for helping with surgical preparations, assisting in surgeries, monitoring anesthesia, and assisting in examinations. She takes her talents one step further by running in house lab work, preparing prescriptions, and doing thorough dental cleanings. Kate finds a great deal of satisfaction in being an advocate for animals and comforting sick or injured pets. She owns one pet of her own, a domestic short hair cat named Dexter. 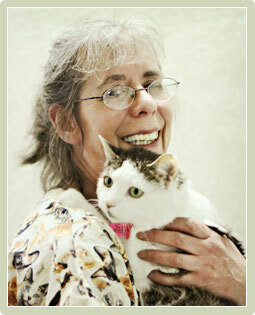 Karen joined Stone Veterinary Hospital in 2006. As a veterinary technician, she particularly enjoys providing support and comfort to patients, especially those who are confused or in pain, as well as their owners. "I have the greatest boss in the universe," she said. "All the doctors and staff are committed and care and so easy to work with." 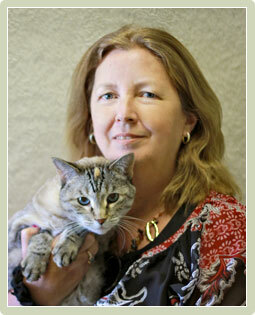 Karen has a bachelor's degree in fine art and an associate's degree in veterinary technology. She shares her home with seven cats: Eddy, Cora, Eloise, Pugsley, Loretta, Ubee and Brooster. Sherry is a lovely and talented Certified Veterinary Technician who has been working with Stone Veterinary Hospital since November of 2012. She brings with her a passion and wealth of experience, as she has been working in the animal related field for over 24 years! Prior to establishing herself as one of our phenomenal CVT’s Sherry worked in specialized care for small animals and in veterinary medicine. She is very knowledgeable in both pet nutrition and raising puppies. Some of Sherry’s responsibilities here include preparing and monitoring anesthesia for surgery, taking dental x-rays and providing oral cleanings, record and history taking, and client education. She also is a great deal of help when it comes examinations and assisting her fellow team members and our veterinarians. One of her favorite aspects of working with us is getting to educate our clients on the best nutrition available, and seeing a patient improve from dental procedures. Many of Sherry’s weekends are spent at dog shows. She loves to show and breed French Bulldogs and has been doing so since 2001. Sherry is an active member of the French Bulldog Club of America and owns 2 French Bulldogs herself named Sham and Spiral. She also owns a Pitbull/Lab mix named Riley, 2 cats, 5 birds, 8 turtles, and a chameleon. In her down time, Sherry can be found spending quality time with her pets and fiancé. They enjoy being outside, playing in the yard, and going for the occasional hike. 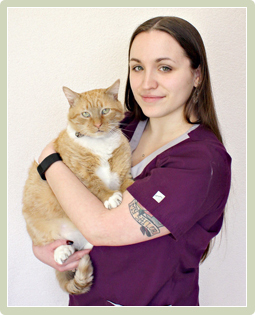 Jessica joined Stone Veterinary Hospital in September of 2015. 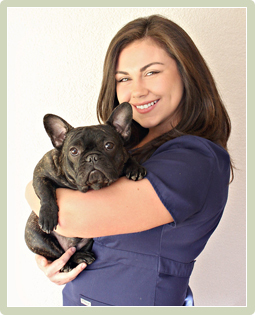 She brings 10 years of experience as a Client Care Coordinator and Veterinary Technician to the practice. Jessica splits her skills between receptionist two days a week and technician two days a week. "I love the mix between front and back, it gives me a feeling of fulfilment that just one area doesn't." "I love that I am learning from these doctors and technicians," she says. "Everyone has a lively spirit and diverse education. There's something to be said for being able to learn from such a great group of people." In her spare time, Jessica spends her days with her fiance Joe and their two Pit Bull mixes, Turkish and Wrigley; and two Siamese mixes, Nova and Blu. She also loves to bake and cook, and spends her Fridays taking care of her niece and nephew in Sandy Hook. Lindsay joined Stone Veterinary Hospital in September of 2015. Her nine years of customer service experience have helped her fit right in at the front desk. Lindsay enjoys working with people and animals. "Before this, I was a manager at Petsmart," she says. "I loved being able to work with animals then, but being in this hospital environment now is so much more rewarding." In her spare time, Lindsay enjoys hiking, cooking, and painting. She lives with her boyfriend Matt and her two cats, Miss Lady and Kiddin. One of Stefanie’s strongest assets as our Exotic Animal & Wildlife Veterinary Technician is her ability to work with different species of animals. 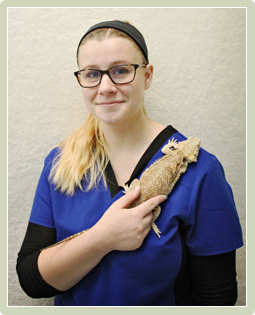 She is skilled at handling the medical needs of various species like reptiles, birds, and small mammals with an empathetic and comforting approach. Stefanie is great with fearful or aggressive animals and has a heart big enough to help her relate with them. 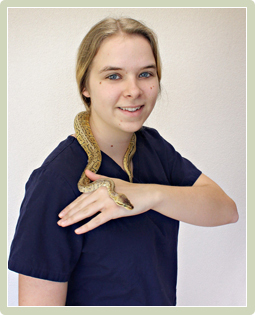 Stefanie is Fear-Free certified and holds certificates in cold laser therapy and wildlife rehabilitation. Before joining our team at Stone Veterinary Hospital in November of 2013 Stefanie was a volunteer and worker for Ansonia Nature Center. She has been working with various sorts of pets and their caregivers for over 15 years and loves her career. As a hobby, Stefanie likes to practice wildlife photography and works closely with CT Wildlife Rehabber Association. Stefanie spends her spare time with her husband and their two children. 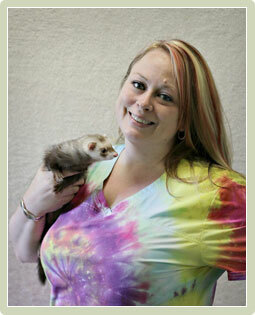 She is a major advocate for wildlife rehabilitation and volunteers her time training others to be effective rehabbers. Stefanie also enjoys going for hikes and taking photos in nature. At home, Stefanie owns several pets including a dog named Capone, a cat named Pickles, a kitten named Axel, two ferrets named Princess Peach and Vizzini Luigi, a Bearded Dragon named Mabel,2 fish and a clawed frog. Kati joined Stone Vet in November 2017. 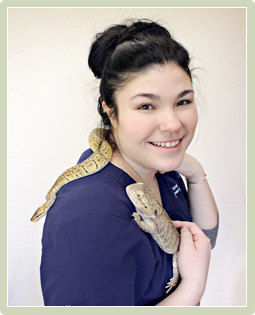 As a veterinary technician she enjoys all aspects of her job but her major interests are surgery and client education. She spends her home life with her husband Jeremy and her adorable son Dominic. She currently has two rescues a cat named Cami and a new dog Jackson. Bridget has been working at Stone Vet since March of 2016, while studying at NorthWestern to earn her degree in Veterinary technology. Outside of work she spends most of her time with her son Adam and hiking. Bringing animals back to their loving owners in better health after is one of the most rewarding aspects of being a Veterinary Technician to Becky. 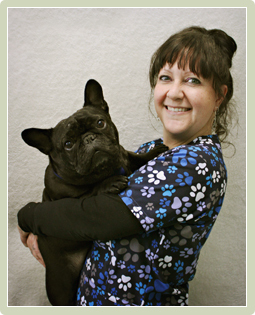 Each day Becky brings with her a positive attitude and a helping hand to Stone Veterinary Hospital. She is great at helping with animal restraint, running lab work, radiology, customer service, and medication administration. Becky is very knowledgeable in the exam room, and is always willing to educate our clients on the procedures we provide. Becky has been working for Stone Veterinary Hospital since December of 2015 and has loved each day since. She is a graduate of Northwestern Connecticut Community college and holds an associate degree in Veterinary Technology. Becky is a valuable team member who is experienced and compassionate in every capacity. Outside of work Becky can be found on the volleyball court a good amount of the time. She is also passionate about video games and eating great good. 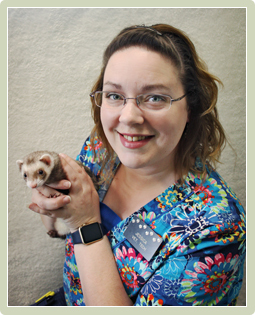 Becky shares her home with 2 cats, named Charley and Raven, and a Lemonblast Ball Python named Ruger. Ashley, one of our talented Veterinarian Technicians, began working with Stone Veterinary Hospital in June of 2018. She has been working in the animal related field since she was in middle school and loves her profession considerably. Her passions in veterinary care started by riding in competitions, working with horses, and providing equine care. Eventually this culminated into a desire to help a broader range of animals in need of medical attention. 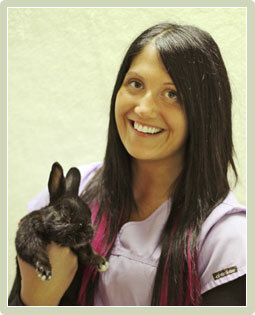 Ashley helps with examinations and assisting our veterinarians, phlebotomy, radiology, and much more. She is also is great with customer service and communicating with our clients to provide more information and comfort. As a graduate of the University of New Hampshire Ashley majored in Equine Management. She also possesses a degree in Veterinary Technology from Cedar Valley College and has been working as a Veterinary Technician since 2014. Some of Ashley’s hobbies include reading, traveling, and spending time with her dogs. She owns a black and tan Coonhound, named Mayzie, and a Red Heeler named Bentley. Addressing and taking care of our clients’ needs is one of the many roles Aurora helps with as a Receptionist for Stone Veterinary Hospital. She does so with implicit care, tending to the needs of our clients on an individual and unique basis. Each client and patient have a different story, and Aurora is great at working with our clients learn about them and to come to better understandings. She offers experience in emergency medicine, and is a great help with answering phones, scheduling appointments, managing transactions, and client education. Aurora was welcomed to our team in May of 2018 but has been working in the veterinary field since 2000. Prior to joining Stone Veterinary Hospital, Aurora has worked with other veterinary hospitals serving as a client liaison, discharge nurse, and assistant. She also has experience as a Volunteer Coordinator at Purr Project, a no-kill cat shelter. Aurora loves to spend her spare time with her family and children, Logan and Ava. They own 3 cats of their own, all Domestic Short Hair cats, named Akio, Keagan, and Allen. Stone Veterinary Hospital was proud to welcome Liz as one of our incredible Receptionists in October of 2018. Since becoming a wonderful member of our team, Liz has proven herself to be a positive influence in our daily operations. She helps with answering phones, scheduling appointments, greeting our clients and patients with a friendly smile, and much more! Her favorite part of working with us is helping all the furry friends that enter our facility and engaging with their loving families. While she isn’t sharing her smile at work, Liz loves to spend her free time hiking with her dog. Liz owns a Staffordshire Terrier/Boxer mix named Stella, who she adores dearly. She also likes to spend her down time by riding horses, partaking in stand up paddle boarding, and going to local breweries. Liz loves to spend time with her family and friends and is also happy to find an interesting read whenever she has the chance.